The above calculator calculates the age considering the accurate number of days of months to give you accurate result. Example, It is calculates 31 for January, 30 for April, 28 for February even 29 for leap year. 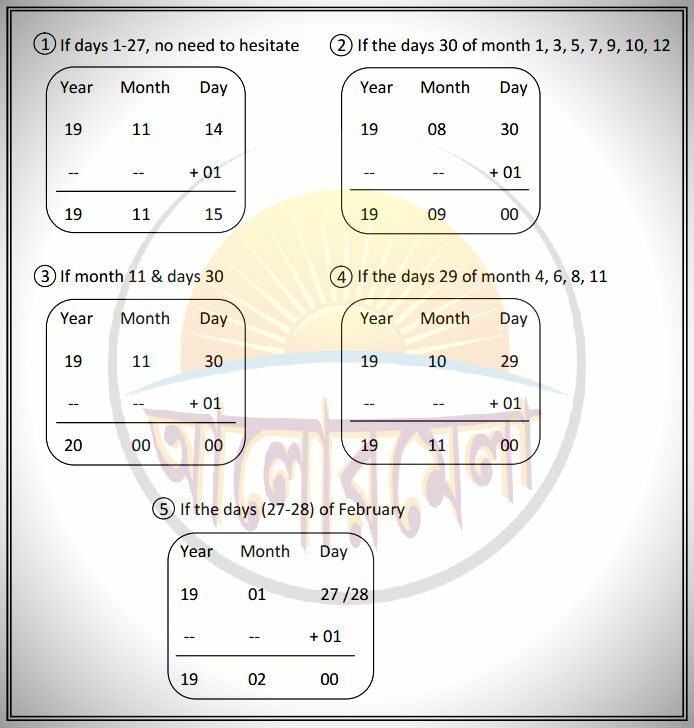 You should know that most of calculator and systems don’t follow the above rules and in some cases they counted all the months by 30 days only. So sometimes you mightn’t get accurate result from them and age result can be different 1-4 days if you compare the result among us and other ordinary calculator or systems. Be sure the above result is the difference between birth date and target date. And the day of birth is not included to the result. Let's, A child boarn in first day in a month, how old will he on the date 9th in the same month? Your accurate age should be = target date – birthdate + birth day (+1). Actual age = 9 - 1 +1 = 9 days old. So you must add a day (+1) to calculated result if you want to use your age in any document. If you see the result of days are displayed 29 or 30 you should consider the number of days of relevant months when you will add +1 days. You should know January is counted by 31days, February 28 & 29days, March 31days, April 30days, May 31days, June 30days, July 31days, August 30days, September 31days, October 31days, November 30days and December 31 days. Let’s, your age is 19 years 8 months 30 days (figure 2). Be sure if the month of above age is 8 and it must be August. And the days 30 must be for the next month September which is running month and uncompleted. How to understand that the calculated age is right or wrong? Sum of your age and date of birth must be same to target date. If not your calculated age is wrong. Please comment here your experience with the age calculator and alormela. Write us if you see any mistake or error in the age calculator. We will try to update if found anything wrong. Wow ! It's an excellent age calculator. I was born in October 31, 1986. I am so happy that I found here that the day was Friday. Thanks Alormela for this great calculator. This is great! This is giving accurate age calculation. Wow!! It's really nice age calculator. I want to say you thanks from deep of my heart for describing about some common mistakes which I did. I am sure if all months are counted by 30 days age result can't be right always.